Ready to drink in easy to use aluminum cans comes Blue Can Emergency Drinking Water with a 50 year guaranteed shelf life. Processed and canned in Southern California, packed in eco and environmentally friendly materials, this canned emergency water is the perfect long term storage solution for your emergency preparedness and safety. 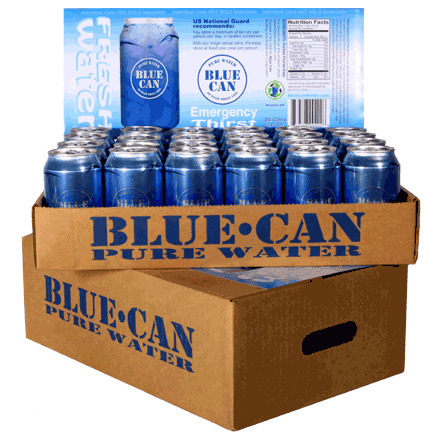 What makes the BlueCan 50 year shelf life canned water different and special? The water filtration process starts with already safe to drink municipal water that is treated further by being purified, sterilized and pasteurized to remove any chemicals or particles using a 12 step multi-stage filtration process. Included in the process are active-charcoal filters, dual-reverse osmosis high pressure, six stage micron traps, two sterilizers equipped with high intensity UV light, an active PH balance unit and a final pass through a high pressure active charcoal micro filter. Once the water has been purified to less than 1 ppm we retain that purity by immediately "pressure sealing" it in our blue cans. Once inside the can the pure water is shielded from sunlight which contains UV light that causes ordinary plastic bottles to deteriorate and leaking of toxic plastic chemicals into the water for potential consumption by you. Because of the purity of Blue Can water, combined with the most user friendly packing method, this canned water with 50 year shelf life is the preferred solution for water storage for families, hospitals, agencies, businesses and organizations. BlueCan Canned Water will stay fresh for decades, because the aluminum cans protect the contents from UV light and other environmental factors. You can count on having safe and clean water when you need it.